If you need to cancel or amend your booking, please provide at least 2 days’ notice to avoid cancellation charges. Payment of the full booking amount plus a security deposit of $50 is taken as a credit card pre-authorisation at check-in unless the booking is a non-refundable rate plan. We pre-authorise a credit card at check-in for any charges we determine that the guest may be likely to consume during their stay. This also includes an amount to cover a security bond / deposit for damages. The pre-authorised amount of $50 is set aside by the credit card company for a period of up to 7 days after check-out. The pre-authorisation will affect your available funds and / or spending limit. For more information on this practice we suggest the cardholder contact their card issuer. No money is taken from your credit card but it will show as a 'Pending Transaction' and you may choose to use a different payment type to pay your final bill. Haka Hotel Newmarket is our flagship hybrid hotel. Expect all the hotel essentials but none of the fuss! By choosing to focus on clever design, ultra-modern technology and shared spaces we offer the modern traveller new & stylish ways to stay connected. Our hotel accommodation ranges from smart private rooms, studio rooms with outside decks, & innovative hotel-standard bunk rooms. All rooms have private bathrooms & free unlimited Wi-Fi as standard. Add to this our sunny style-led interiors, shared work space and an in-house coffee hub, and you have Auckland's most forward thinking hotel. 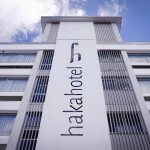 As with all Haka Hotels, Haka Hotel Newmarket is carefully crafted to maximise your experience of New Zealand’s cities. Whether your focus is recharging, exploring or business, our blend of personalised service, creative attitude & commitment to quality will make your journey seamless.